The 1.2 R4 TSI/TFSI (EA111 family) is a 1.2-liter four-cylinder gasoline turbocharged engine firstly introduced for VW Golf Mk6 and Polo Mk5 in late 2005. This engine partly replaced the same displacement naturally aspirated version of the EA111 series but with three cylinders – the 1.2 R3 EA111 engine. The 1.2l TSI version is based on the 1.4 TSI/TSFI engine design. Instead of grey cast iron engine block which the 1.4-liter version had, the 1.2 TSI/TSFI has an aluminum cylinder block with cast iron sleeves (liners). The bore size was reduced from 76.5 mm to 71.0 mm but it kept the same stroke (75.6 mm). The bottom end also received new die-forged steel crankshaft and cast aluminum alloy pistons. All moving components became lighter. On top of the engine block there is an aluminum alloy cylinder head. It has two valves per cylinder (eight valves total) and single overhead camshaft (SOHC layout). That is a real task for small displacement engines to make them more pleasurable for a driving because of torque lacking. In this case, 2-valve heads provide more torque at low and mid-range of rpm. The intake valve diameter is the 35.5 mm; the exhaust valve diameter – 30.0 mm. The engine has a non-serviceable timing chain. The valves are actuated by roller finger cam followers with hydraulic tappets (no valve clearance adjustment required). The engine equipped with the IHI 1634 turbocharger. The max boost is 1.6 bars (23.2 psi). The compressed air is cooled by water-cooled intercooler integrated into intake manifold. There is also electronically controlled Bosch "E-Gas" throttle valve. The engine has the Fuel Stratified Injection (FSI) system. The camshaft-driven high-pressure injection pump supplies fuel with pressure 150 bars (2,180 psi). The sequential fuel injectors inject fuel directly into combustion chambers. The ignition system is fully electronic; each spark plug operates with its individual spark coil. The electronic engine control unit (ECU) for 1.2 TSI/TSFI engine is the Siemens Simos 10. 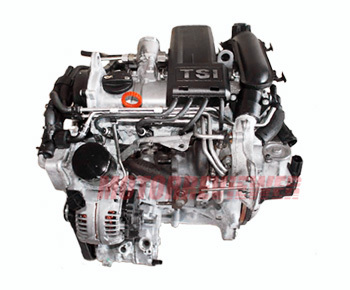 The 1.2 R4 TSI/TFSI engine is 24.5 kg lighter the 1.4l TSI, has good power and torque for a small city car. The main target (replacing of old 1.6l engines) was achieved using modern fuel injection system combined with a turbocharged intake. In 2015, the new 1.2 TSI ЕА211 engine came on the production lines, but the predecessor was being produced until 2017. The most common issue is a stretched timing chain and timing chain tensioner failure. That can happen on a relatively small mileage – between 40,000-60,000 miles (60,000-100,000 km). The engine produces a lot of vibrations – this is a normal cold engine operation! Also if you live in a cold climate it is important to know what the engine warms up only under a load (turn the key and drive without time for warm up the engine course it takes forever). The engine required high-quality fuel (95 RON ultra-low sulfur unleaded petrol (ULSP)) and engine oil. The engine reliability also depends on the driving style of owners and how timely maintenance was. The average lifespan of the 1.2 TSI engine is 150,000 miles (250,000 km). CBZA - 86hp (63 kW)/4,800 rpm; 118 ft lb (160Nm)/1,500-3,500 rpm. This is the weakest version. Can be found inside Volkswagen Golf Mk6 and Audi A1. CBZC - 90hp (66 kW)/4,800 rpm; 118 ft lb (160Nm)/1,500-3,500 rpm - Volkswagen Polo Mk5 1.2 TSI engine. CBZB - 105hp (77 kW)/4,800 rpm; 129 ft lb (175Nm)/1,550-4,100 rpm. The most powerful engine is for the SEAT Ibiza.